Are you addicted to chairs? Does your back hurt? Here’s an approach that will let you gently cure your addiction and mend your body naturally. 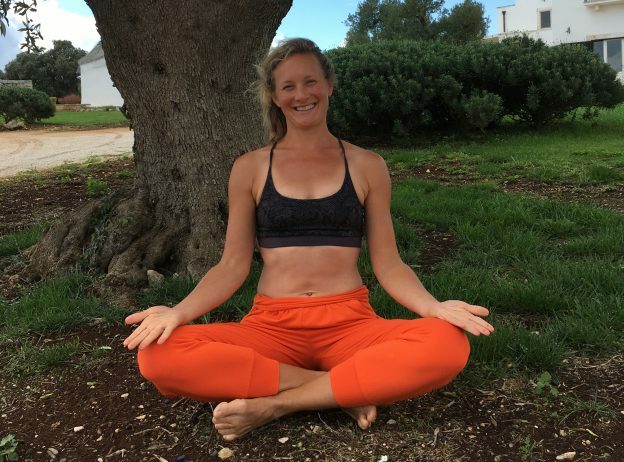 Traditionally, yoga is a preparation for long periods of sitting and the lotus position would have been a comfortable pose to remain in whilst meditating for very many hours. Of course, after all the hours sat at chairs, in our usual slack core, tense hip pose, it won’t be a good idea to hop straight into poses that require flexibility or much mobility of the knee-joint. But if, every day, we start to sit in chairs less, we start to squatand sit cross legged more, we move and mobilise our knee joints as well as our hips, and hamstrings, we might find that our backache is reduced. So this week, perhaps pay extra attention to how you sit,not only on the mat, but off it. Are you comfortable? Are your shoulders down, your core subtly engaged, your chest open, your hips feeling free? And what can you do to change that? Those with tight hips find sitting still for ages hard and a recipe for pins and needles .. if this sounds like you we would recommend a prop. This can be sitting against a wallsometimes for a long meditation.. or a wedged type block… or a bolster​ or even just a cushion.. Many folks find trying these things can give access to sitting on the floor for longer. And don’t forget a soft blanket under any boney ankles out there! Do let us know how you get along!